Several types of apparatus are available for the determination of properties of soils. It was observed that the same property, determined using different equipment, may yield different results. 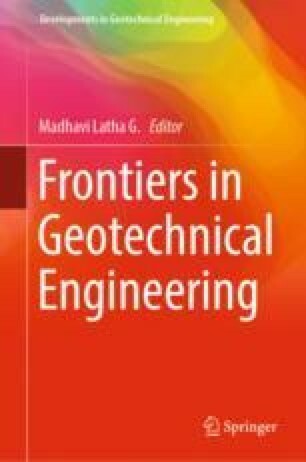 This paper discusses the effect of test method on properties of soils such as liquid limit, swelling pressure, drained angle of internal friction of fine grained soils, radial coefficient of consolidation and interface friction angle. It was observed that the liquid limit determined from fall cone method is slightly higher than that obtained from Casagrande’s apparatus for low values of liquid limit. However, the opposite trend is observed for higher values of liquid limit. The swell pressure value obtained from the different pressure methods is the lowest while the swell-consolidation method yields the highest swell pressure. The drained angle of internal friction of fine grained soils obtained from triaxial compression test was found to be higher than that obtained from direct shear test. Radial consolidation tests conducted on a fine grained soil show that the radially outward consolidation test gives lower values of radial coefficient of consolidation compared to radially inward consolidation test. The interface friction angle determined using direct shear tests show that the magnitude of friction angle depends on the mode of shear. The likely reasons for the differences in the values obtained are discussed in this paper.